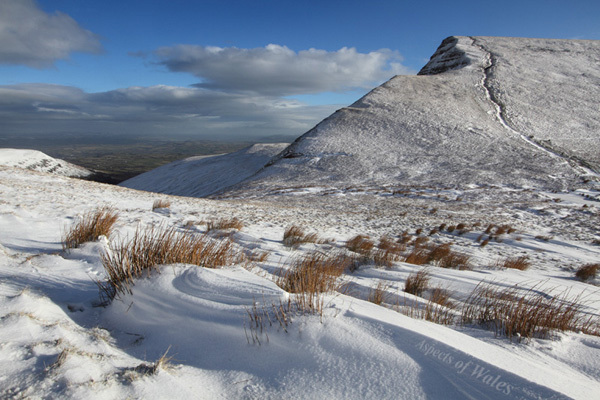 I was at the top of Pen y Fan for sunrise on 1st February 2015, then walked to the top of Cribyn. I took this photo on the walk back, where I stopped between the two peaks to shelter from the wind and have slice of Christmas cake, at NGR SO 01814 21226. The northerly wind was strong and bitterly cold, and the cake was the best thing I've ever tasted. Canon EOS 7D, Canon EF-S 10-22mm lens at 14mm, Manfrotto tripod. Exposure F11 at 1/200 sec. Original image in Raw format.